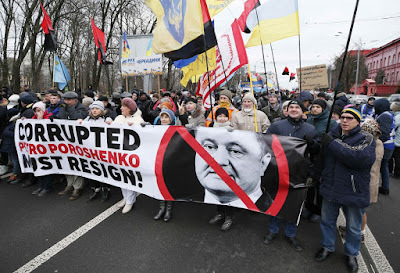 KIEV, Ukraine -- Thousands of demonstrators have marched in the Ukrainian capital to demand the resignation of President Petro Poroshenko. The protest of about 5,000 people in Kiev on Sunday was led by Mikheil Saakashvili, the former Georgian president who moved to Ukraine as a Poroshenko ally but then was stripped of his citizenship last year, per the AP. Saakashvili was abroad when he lost his citizenship, but he forced his way back into Ukraine in September and since has led repeated protests against Poroshenko, alleging the president is corrupt. The rally was broadcast live on his Facebook page, with protesters making a few demands: the resignation and impeachment of Poroshenko, a new parliament in which members serve for a term of one year, and a new government that would implement a program called "70 Days of New Power." "Today's action is the beginning of a campaign to dismantle this rotten and corrupt system. And Poroshenko's resignation is only the first step." Protesters have even selected a resignation date for Poroshenko: Feb. 18, when they want him to come to Kiev's Independence Square (aka Maidan Nezalezhnosti) to announce he's stepping down. "At noon [on that day], we will come to Kiev's Maidan, to [squares] in each and every Ukrainian city. There will be millions of us. Get out of our way!," a member of Ukraine's parliament said at Sunday's rally. No arrests or clashes with police were reported.